KJD LIFETIME inner bag liner for BMW 49 liter top case: R1200RT, K1300GT, etc. 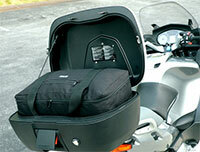 Kathy's Journey Designs inner Top Case bag for BMW R1200RT, R1200ST, R1200R, K1200GT (2006 or later), K1300GT and other BMW's equipped with the large BMW 49 liter Top Case (including more recent bikes like the R1200RT LC and also the K1600GT/GTL which will apparently accept this case as an alternative to the standard K1600 Top Case offering). Strap included! 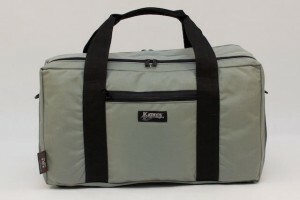 Kathy's Journey Designs inner bags for side cases and top cases are designed to help you make the very most of the available space, adding the convenience of easy & fast removal of the contents when you arrive at your destination (or during your in-between stops of course). If you chose this extra-spacious top case, chances are you're traveling with a passenger, so we made this handsome luggage with two separate but equal size sections. 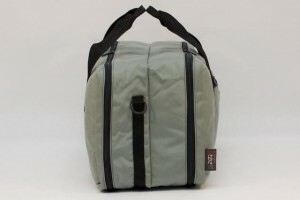 Each big compartment opens around three sides for easy access with its own 2-way zip. 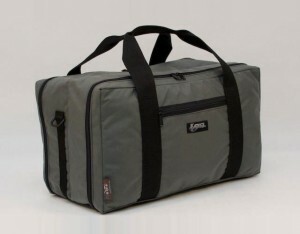 Both sides also have an inside zipped mesh pocket to help keep contents organized. There is a smaller external zipped pocket on one side which, when face-up in the top case, is readily accessible when the lid is open. It also helps you identify one side from the other. 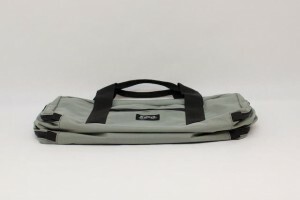 Kathy's double top case liner has balanced double cradle carrying handles plus D-rings to attach the supplied shoulder strap. 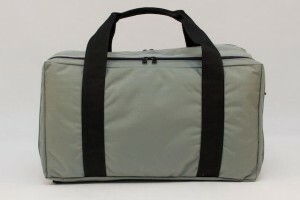 This liner bag is now also available in a single compartment version for those customers who may prefer this alternative, this simpler version is available to order and looks the same as the dual version pictured above, except for the middle seam which is not present on the single version. Please note that there may be an extra delay in receiving the single compartment version as it is not normally stocked, also the black version is sold at a lower price than the other colours. When ordering, please do not hesitate to specify your alternative color choice in the case of your first choice not being immediately available for shipment. IMPORTANT: Please note that occasionnally certain colors may not be available in stock for immediate shipping, so do always contact us before ordering if you are expecting same day or next day dispatch of a specific color! Kathy Anderson and her team construct each of these items at their shop nestled in the Blue Ridge Mountains of Virginia in the USA. This product will also fit the newer alternative version of the BMW 49 liter Top Case which incorporates gas-filled struts to hold open the lid, although the fit will obviously be tighter at the 2 locations where the case is shaped inwards to allow space for the struts. KJD LIFETIME inner saddlebag liners for BMW R1200RT, K1200GT, K1300GT, etc. 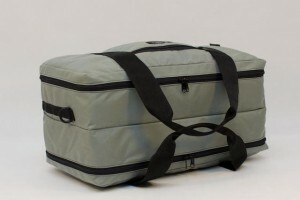 KJD LIFETIME inner bag liner for BMW 28 liter top case: F800GT, R1200R, etc.